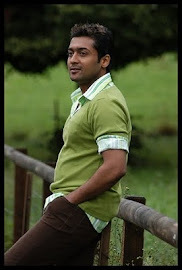 Surya and the 7am Arivu team were shooting in Mumbai, recently. Priyanka Chopra was present in the vicinity and she came over to say hello to cinematographer, Ravi K Chandran, since the two of them have worked together. She enquired about Surya, and said that she has seen him on the cover of a lot of magazines. Apparently, Priyanka thinks Surya is really hot and one of the best looking men in the country! Looks like Surya has even more fans than he knows!